To honor the Feast Day of St. Francis of Assisi, together the Jesuit Conference of Canada and the United States and the Ignatian Solidarity Network released a new “Ecological Examen.” Based on the Examen prayer of St. Ignatius of Loyola, the Ecological Examen is a tool intended for individuals, parishes, schools, and other community groups to intentionally reflect on one’s relationship with God, creation, and humanity. Fr. Timothy Kesciki, SJ, the President of the Jesuit Conference, introduced the Examen with a brief video linking the Examen to Pope Francis’ papal encyclical Laudato Si’. Christopher Kerr, executive director of the Ignatian Solidarity Network, said, "Now more than ever, we need to reflect on the ways our care for the Earth impacts our brothers and sisters throughout the world. 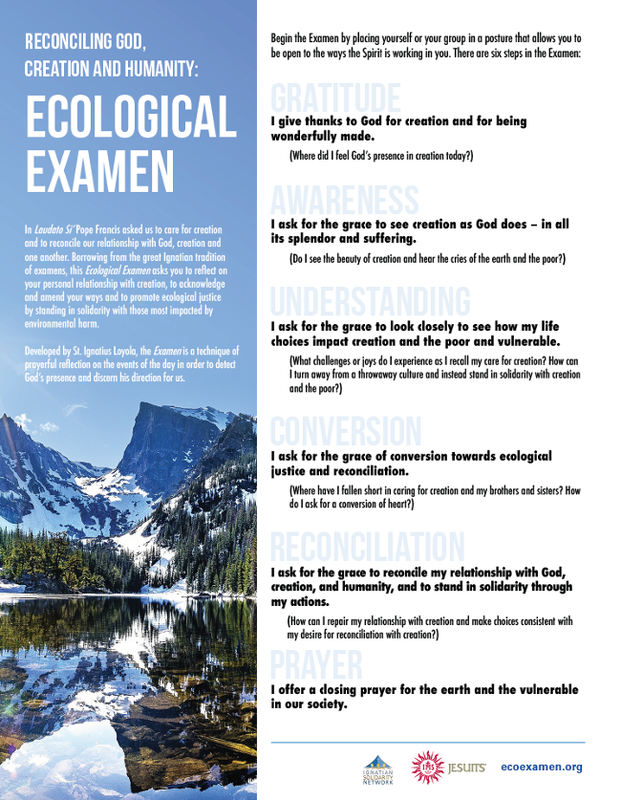 This examen provides a prayerful way for institutions and individuals can engage in ways that lead us into deeper relationship with God, creation, and others. Conversations Magazine featured an issue on campus responses to Laudato Si’ in 2016. Since then, many colleges and universities have increased their commitment to responsibly stewarding campus resources as well as developing more sustainable campus initiatives. Global climate change has made these campus initiatives and this Examen even more important. Copies can be both downloaded and ordered on the Examen website, www.ecoexamen.org. How might Jesuit colleges and universities use this Examen to reflect on previous experience and participate in actions that lead to increased reconciliation with God, creation, and humanity? Founded in 1540 by Saint Ignatius Loyola, the Society of Jesus (commonly known as the Jesuits) is the largest order of priests and brothers in the Roman Catholic Church. Jesuit priests and brothers are involved in educational, pastoral and spiritual ministries around the world, practicing a faith that promotes justice and putting reconciliation into action. The Ignatian Solidarity Network (ISN) is a national organization that networks, educates, and forms advocates for social justice animated by the spirituality of St. Ignatius of Loyola and the witness of the Jesuit martyrs of El Salvador and their companions.